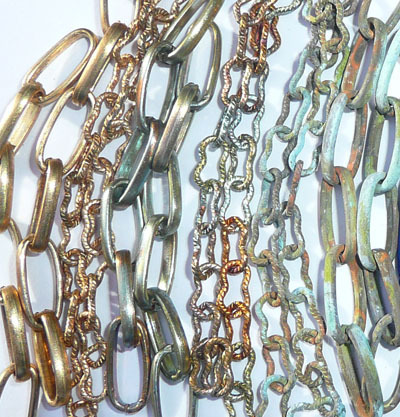 In this tutorial we will concentrate on the ever-elusive colorization of chain. I've found a method that works quite well, I hope you enjoy the process! sealer - I used Protectoclear; there are other sealants that will also work including the Swellegant sealant. So to begin -THOROUGHLY degrease all the items you will be patina-ing. If you leave any greasy fingerprints or machine oil it will leave a spot that stubbornly resists any patina. Items for verdigris patina can be popped into a glass dish with a shallow covering of solution or painted with it and just left to sit. I left mine submerged for 6 hours but do keep removing and rinsing with water and allow to dry as items look different whilst wet, and you can always put them back in again to allow further patina to develop. Keep Checking! 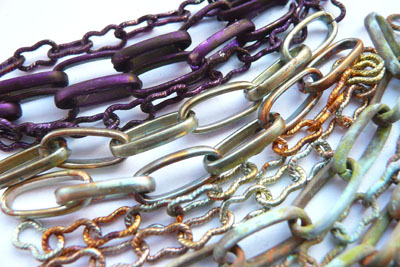 Verdigris is a cold patina- do not heat it! 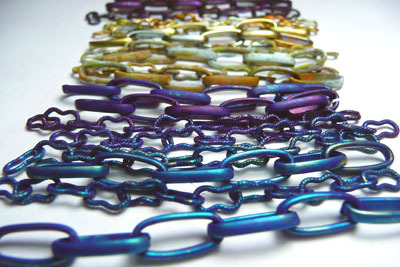 degrease as before, place chain section onto soldering block and heat - NOT until red hot . Pick up with tweezers and promptly place into patina solution in a glass dish. You should hear a PLUNK HISSSS sound as the hot metal hits the dye. Remove and heat again to dry the patina onto the metal. Mind as any wet patina can splatter as you heat it. Repeat until colour develops to the opacity you want. One dip gives a light colour , 3 times a fairly solid coating. I did all of the ones you see below 3 times. 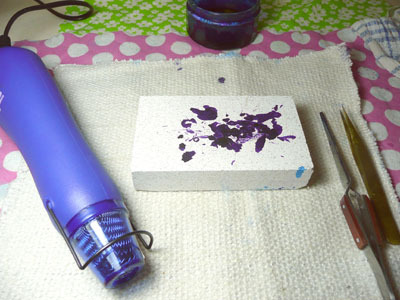 You can also paint the patina solution on using a brush. You can decant the left over patina solution back into the bottle to re use . This is a long -winded but necessary task as without sealing the patina would quickly rub or scratch off. Living in the UK means that I wasn't able to use some of the more well known sealers i.e Permalac or Clearguard. These cannot be shipped over so one has to improvise! I used Protectoclear which is like a thin resin you can dip or sponge on. 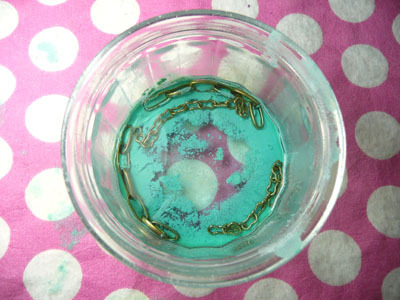 So.. dip the chain pieces into a small plastic measuring cup with a little Protectoclear in. 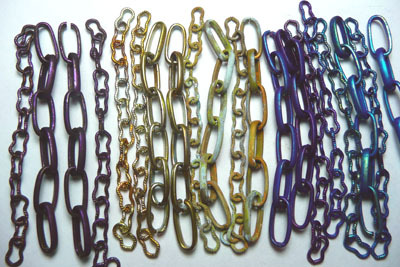 Wiggle a little (the chain - not you) to remove any excess and then hang up to dry. I use cocktails sticks in the jaws of my "third hand"
Make sure no drips form on the end and pop any bubbles that form on the links. 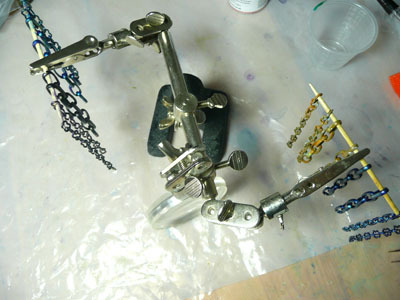 As the chain dries (10 mins touch dry) break the gluey joins between links so they don't stiffen. 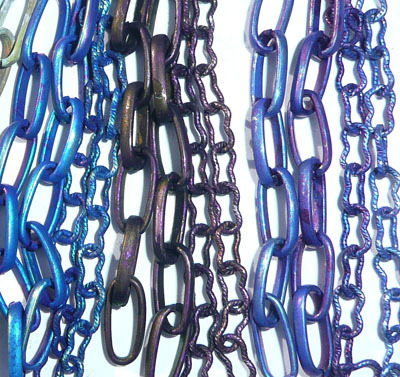 When the chain is completely -dry scrunch it a little to make sure all links are free. Repeat 3 times for a durable coating. ( I know! ) - but gives a lovely satin smooth finish. 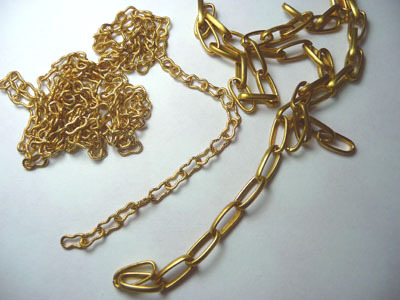 The rectangle chain links can be tricky to open and more so to close flush. Make sure you open them like jump rings otherwise you won't get them to close properly. Use nylon jaw pliers to handle patina -ed metal to avoid damage OR wrap tape around the pliers jaws on regular pliers.